Reghin (Romanian pronunciation: [ˈreɡin]; Hungarian: Szászrégen, Hungarian pronunciation: [ˈsaːsreːɡɛn] ( listen) or Régen; German: (Sächsisch) Regen is a city and municipality in Mureș County, Transylvania, Romania, on the Mureș River. As of 2011 it has a population of 33,281. Reghin lies 29 km north-northeast of Târgu Mureș, extending on both shores of the Mureș River, at the confluence with the Gurghiu River. 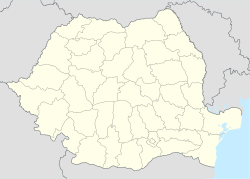 It was created by the 1926 union of the German-inhabited (formerly Szászrégen) and the Hungarian-inhabited (formerly Magyarrégen) city, and later joined with the two smaller communities of Apalina (Hungarian: Abafája; German: Bendorf) and Iernuțeni (Hungarian: Radnótfája; German: Etschdorf), added in 1956. Formally, the latter two are separate villages administered by the city. Reghin was first mentioned in 1228 in a charter of Hungarian King Andrew II as Regun – however, evidence of its strategic location and defence system suggests that the town might have been considerably older, possibly founded by Ladislaus I. In 1920 Reghin was assigned to Romania by the Treaty of Trianon, together with the rest of Transylvania. In 1940, as a consequence of the Second Vienna Award, the city became part of Hungary, together with the North of Transylvania. Almost 30% of the inhabitants were Jews at that time. In May 1944, the Jews were gathered in the Reghin ghetto and on 4 June 1944 were deported to Auschwitz. In 1945, the city again became part of Romania. After World War II, Reghin lost some of its former Transylvanian Saxon character – as many Germans left for Western Germany during the latter stages of Communist Romania – and ethnic Romanians were settled in their place. The data of the 1992 census showed a population of 24,601 Romanians, 12,471 Hungarian, 1,790 Romani, and 346 Germans. In 1994 Reghin was declared a city. Jews began to settle in Reghin at the close of the 18th century, an organized community was established only during the middle of the 19th century, probably in 1849. The majority of the Jews came from Bukovina and Galicia. As a result of the battles during the Revolution of 1848 against Austria and the riots in Transylvania, Reghin and its Jewish population suffered severely. The first Jewish settlers, who arrived mainly from Bukovina and Galicia, were Orthodox, and the community remained Orthodox throughout its existence. Ḥasidic influence was also felt. Besides the synagogue, there were two prayerhouses (kloyz) where the Ḥasidim used to pray and had their own rabbis. A prominent figure in the community during its early years was the Orthodox rabbi Hillel Pollak (who was spiritually close to the extreme Orthodox rabbi Hillel Lichtenstein). A Jewish elementary school was founded in 1874. (Later it ceased its activities but was reestablished in 1910 and functioned until 1940.) The language of instruction in the school was Hungarian until 1918 after which it was Romanian. In 1885 the community became the administrative center for all the Jews of the district. The community numbered 282 in 1866, about 40 families in 1889, and 394 persons (about 7% of the total population) in 1891. Jews engaged in commerce, industry, and crafts. Their trade and industry were mainly connected with timber and some of them owned sawmills; there were also unskilled Jewish workers employed in the timber industry. The institutions of the community assisted the poor. Some of the Ḥadarim established by the community translated the Pentateuch into German instead of Yiddish in order to facilitate study of this language by the children. From 1919 there was considerable Zionist activity in Reghin, and many members of the youth organizations emigrated to Ereẓ Israel. The community numbered 1,587 (about 16% of the total population) in 1930, and 1,653 (about 10% of the total) in 1941. Between the two world wars the Jews suffered from the nationalist and antisemitic activities of members of the Iron Guard, and from the official antisemitic policies of most of the Romanian governments. The change of rule in 1940 (from Romanian to Hungarian) did not bring with it any improvement, as was hoped by the Jews, who remembered their legal emancipation in 1867 by the Austro-Hungarian authorities. In the summer of 1944 the local Jews were concentrated into a ghetto set up in a brick factory. Jews from the surrounding area were also brought there. From this ghetto about 6,000 Jews were deported to Auschwitz by the Hungarian authorities, at the request of the Nazi occupiers. After World War II, in 1947 a community numbering about 820 was formed mostly by survivors of the death camps and other Jews who had arrived in Reghin from places in different parts of Romania. The community gradually declined as a result of immigration to Israel and elsewhere. In 1971 there were still some 20 to 25 families living in Reghin and even fewer in the early 21st century. Reghin possesses some of the architectural elements that are unique in Transylvania. The stylistic details and the wrought iron balconies in the centre of the town are examples that prove the artistry of the local craftsmen. One passes everyday by the apparently modest, yet defining signs of an ancient civilization. They personalize almost each and every building from the center of the town, making the visitor feel the fragrance of times gone by. The Evangelical church also known as the "Saxon church" has a tower that measures more than 47m high. The four smaller towers are proofs of the town's "Right to the sword". The construction of the church began at the end of the 13th century. Over the years, the architecture was modified because the church underwent many dramatic events. It was set on fire in 1400, 1630 and 1778. The documents reveal the use of several styles of early and transition gothic style. The church was consolidated in 1501 and since 1551, when the Transylvanian Saxons adopted the Lutheran Reformation, on the main wall are written the words: "Redemption cometh not from war, it is for peace that we all pray.". Inside the church there is an organ with 20 registers that dates from 1784. The Huszar Castle, former Bornemisza, situated in Apalina dates from the 13th–14th centuries and was restored in the 19th century. In the old mansion of the castle lived between 1584 and 1592 Gyulai Pál of Apalina (1559–1592). He was a royal diplomat, historian, chronicler, doctor and classical poet. The castle was built in the Renaissance style with baroque elements. In 1953 the castle was taken over and used by different educational institutions for disabled persons. It has recently been returned to its owners according to the new laws of property. The "Petru Maior" municipal library has more than 130,000 books, among which one dating from the 16th century. Another important book is Petru Maior's "History of the Romanians' Origins in Dacia". The Ethnographic Museum has a rich patrimony, grouped in 49 collections of ethnography, folk art, artistry, records. The edifice is a monument of architecture built in 1892. The items exhibited concern trades, national costumes, and tradition specific to the upper course of the Mureș River, Gurghiu valley and part of the Transylvanian Plain. The "Eugen Nicoara" community centre was built between 1938 and 1939 when Dr. Eugen Nicoara was the president of the Reghin department of Astra Foundation. Representations of theatre, folk music, dances, chamber music, etc. are held on the stage of this building. The building in which the "Alexandru Ceusianu" secondary school functions was constructed in 1870 and housed the local law court. Lately in the post-war period, there was the Hungarian pedagogical school. Close by, was the house of the writer and magistrate Alexandru Ceusianu. The industry of Reghin is closely related to the traditions of the medieval trades and of the modern cooperative associations. Starting with the resources in the close vicinity, rich in wood and farm produces, the goods of the private producers from Reghin are in the market all over Romania and abroad. The wood processing industry is represented by companies such as Larix, Gralemn, Remex, Bucin-Mob, Prolemn, and Amis. Reghin is well known for the industry of the musical instruments, especially of violins. There are many companies that produces instruments using the famous resonance wood from Calimani and Gurghiu forests. The violins made in Reghin are used abroad. The "Hora" Company is the first to manufacture instruments. In time, other companies were set up among which "Gliga Instrumente Muzicale". Yehudi Menuhin used a violin made by "Gliga" company. Reghin is presented by Avântul Reghin at association football. Avântul played in Liga I in 1955 season. They play in Liga III for 2015-16 season. In 1850 the population of the town was 4,227, 2,964 of them being Germans, 644 Romanians, 556 Hungarians and 63 others. In 1910 Reghin had 7,310 inhabitants, and the ethnic composition was made of 2,994 Germans, 2,947 Hungarians, 1,311 Romanians and 58 others. the Protestant (Lutheran) church, built in 1330 in honour of Saint Mary. Burnt down in 1708 and in 1848, after which it had been rebuilt. the Roman Catholic Church, which was consecrated in 1781.
the Protestant (Calvinist) church, 13th century, in 1910 completely rebuilt. a Calvinist church built in 1890.
the Greek-Catholic church, built in 1744, nowadays Romanian Orthodox. the Greek-Catholic church, built between 1811 and 1813, nowadays Romanian Orthodox. a Romanian Orthodox Cathedral was built in the city in the 1990s. the renowned zoological and folklore collections. ^ a b Rezultatele finale ale Recensământului din 2011: "Tab.5 Tab5. Populaţia stabilă pe sexe şi stare civilă – judeţe, municipii, oraşe, comune". Institutul Național de Statistică din România. February 2016. Retrieved 2 February 2016. ^ "YIVO - Reghin". www.yivoencyclopedia.org. ^ a b c Costea, Ioan I. Reghin: Destin și istorie. ^ a b c d Ploieșteanu, Grigore; Șara, Marin (2006). Reghinul cultural. Reghin. ^ Pop, Simion T. (2008). Comorile Transilvaniei: REGHIN. Reghin: ROMGHID. ISBN 978-973-88446-1-2. ^ Rosenstein, Neil (1976). The Unbroken Chain: Biographical sketches and the genealogy of illustrious Jewish families from the 15th–20th century. Shengold Publishers. p. 611. ISBN 0884000435. ^ Lev, Baruch (2007). There is No Such Thing as Coincidence 2: A new collection of stories about Divine Providence. Feldheim Publishers. pp. 72–74. ISBN 1583309403. Costea, Ioan I. Reghin: Destin și istorie. Ploieșteanu, Grigore; Șara, Marin (2006). Reghinul cultural. Reghin. Pop, Simion T. (2008). Comorile Transilvaniei: REGHIN. Reghin: ROMGHID. ISBN 978-973-88446-1-2. Wikimedia Commons has media related to Reghin. primariareghin.ro - official website of Reghin City.